We are winding down 2017 and December always seems so stressful. Even though its my birthday people are consumed with end of year wrap ups and Christmas/ other holidays. Have you heard of an advent calendar? They are a fun way to count down to the new year, typically done with chocolates... BUT CLARINS DID A VERSION WITH BEAUTY. Advent calendars are traditional, but I grew up with advent candles. I like the aspect of remembering now only how close we are to Christmas (whatever Christmas means to you) and reflecting on each day. The Clarins advent calendar is valued at $218 but you can purchase it for $124. If you shopped during black Friday it was 20% off! On black Friday I purchased a new bottle of double serum. I ran out but wanted to wait for black Friday to buy a new one. The 1.6 oz bottle retails for $122, so I really wanted to take advantage of the sale. The serum has since changed since I started using it! I swear by this stuff and without it for about 1.5 weeks my face has broken out and gone insane. Its also very cold now and Double Serum saved me from looking dull. Moisturizer alone is just not enough for me. This is really funny because when I first started wearing serum I was concerned because my face was traditionally oily however my face has evened out a bit since then. Pictured above is the new Serum (on the left) next to the old one (on the right). Both are 1.6 oz, but the pumping mechanism is so new! The top lets you decide if you need a big pump or a little pump of the serum and its a little easier to push down. It contains 21 plant extracts that target signs of aging within 7 days of use. It smooths, makes your skin radiant, firms, and evens skin tone. I have gone through my skincare routine before here. I might do an updated one next year. 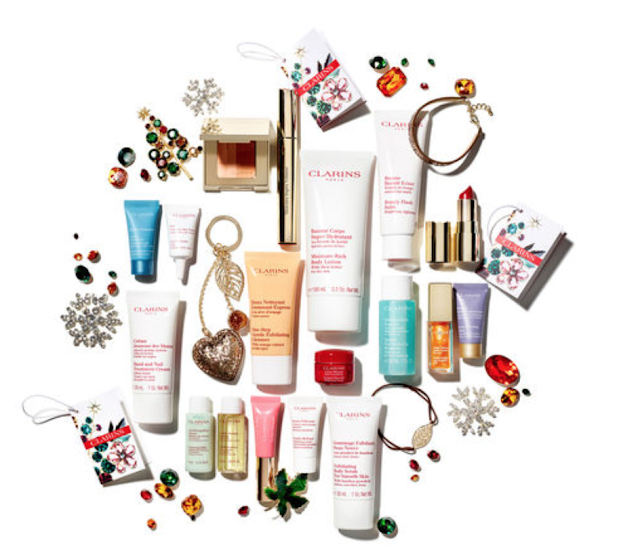 There are so many new advent calendars out there I think its so cute Clarins puts one together every year.